Life is all about experiences that create memories that last a lifetime. 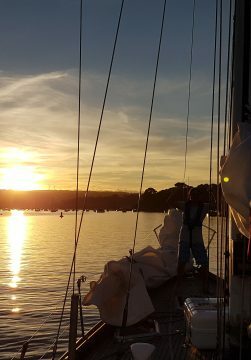 Join us for a hands on sailing holiday on our beautiful 50ft Bowman Cutter, Yemaya of Helford and really experience the feeling of "getting away from it all"
We specialise in hands on sailing holidays that merge traditional techniques with a modern twist. You can relax and enjoy the grace, seaworthiness and character that makes Yemaya of Helford unique. Whether you are a novice or grizzled sea dog our voyages and day trips are suitable for all. With no experience necessary, come and experience sailing at its best. We welcome solo adventurers, couples, or groups of friends or family of all ages. Yemaya is also available for whole boat charter, perfect for a group of up to 8, for a special occasion or great adventure holiday. 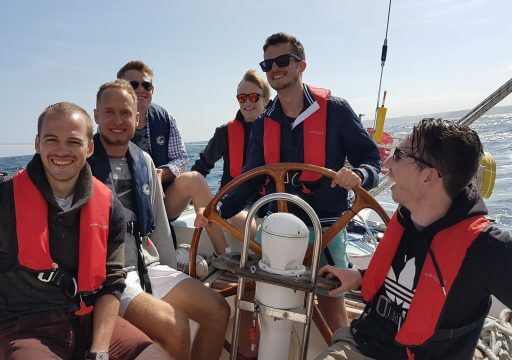 Although our skippered sailing holidays have a professional crew, we encourage everyone to join in as this is a truly hands on sailing adventure. There are many chances to learn the ropes, steer, hoist sails and enjoy life onboard this beautiful bermudan cutter. Getting involved in all aspects of running the boat is good fun, a great adventure and a rewarding teamwork experience. A 1/2 day sail lasts for 4 hours morning or afternoon. Life jackets are provided but it is a good idea to bring warm gear, waterproof clothing and some light soled trainers. The day usually lasts from 9am – 4pm. It comprises a short safety briefing and, depending on the weather and the tides, a morning sail to a secluded anchorage, a deli lunch pre-prepared at home or lunch in a waterside pub/restaurant if you prefer. Followed by an afternoon sail back to the Marina. Adventure Charters are between 2 days and 2 weeks with you being able to tailor the itinerary to suit your requirements. Contact us to discuss destinations and details. Price does not include fuel consumed during charter or mooring fees.